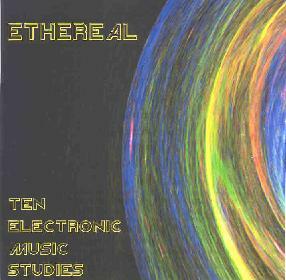 Ethereal - "Ten Electronic Music Studies"
Ethereal is a solo electronic project from Alien Planetscapes guitarist and synth player Richard Orlando. On Ten Electronic Music Studies, Orlando utilizes ARP Odyssey, CMS MR-2 Modular, EMS VCS3, Roland JP-8000, Roland Jupiter 6, and Sakata DPM-48 to produce very busy space electronica that kept me wired and alert dodging meteors and various other space junk throughout. On parts I - IV of "Isotope", the music is never harsh or noisy, but isn't floating or meditational either. A true electronic space symphony with the conductor leading several sections of patterns, textures, and sounds. The music flows very smoothly making it easy to focus on the multiple layers of sounds that are racing along at any given time. But starting with "NGC 2300"... whooaahh!!! Forbidden Planet!!!! This is total space freakout meteor shower electronica like the stuff you heard in the old 50's sci fi flicks. Very cool. "Cygnus Loop" and "MK Ultra" are similar, but the music becomes an epic on "Thor vs. Loki". At 17 minutes the journey extends from meteor showers to black holes, alien spacecraft, time warps... you name it. Having been a Marvel comics fanatic in my youth I couldn't help imagining a huge cosmic battle between the God of Thunder and his ill-tempered half brother Loki. Those two got into some riotous knock-down-dragouts and I could easily picture them flinging each other about heavens. Odin... discipline your boys. In summary, highest recommendation goes out to fans of electronic space music. You'll be busy for many a listen tuning into all that's happening on this disc. It's also a lot of fun given all the old time sci fi influences. I'd also recommend this to spacerockers who typically avoid purely electronic music, favoring the presence of guitars. This is heavy, not in a rockin' sense, but as a total cosmic mind assault. Try it, you'll like it. For more information you can email Ethereal at porcupinejones@yahoo.com. Contact via snail mail c/o Richard Orlando at 144-60 28 Ave; Flushing, NY 11354.